Photo: Austin Wong / ACEA - After reading press release below, it seems all indeed happened as Richard Gladwell / Sail-World reported days ago. The teams in Aruba led by Oracle, and their own broken dagger as Gladwell shot proves in link above, decided that the now "ridiculous" (sic) rule restricting the number of foils (2 sets only) to be used / repaired for the AC50s and actual racing was a bad idea and nonsense. This statement and rule change only after Oracle and maybe other team in Bermuda broke their own mainfoils. So they all voted to modify that "ridiculous" (sic) rule, allowing now more options to replace broken daggers. The Big detail is , this should have been modified long time ago and not triggered by the Defender own foil problems on hitting debris or "big fish" or structural failure. Press release below puts weight on New Zealand, saying they have their own structural mainfoil problems and how they can be against such a rule change? Thanks to the Bermuda teams, this late rule change will allow the Kiwis to replace and have more options on their own dagger failures towards the actual racing. All in all, this late rule change fiasco shows the lack of common sense (or second previous intent or plain incompetence targeting cost reduction framework) on limiting the number of foils to be used which could have resulted in a team breaking 3 or even 4 of allowed boards ...just hitting Marlins at Bermuda... and be left out of the competition with an unscathed floating platform and wing. So comments were not "uniformed" at all, on the contrary, ACEA confirms Richard Gladwell statements and report. Changes being allowed or not by the protocol is secondary in this case. Neither to comment now on the statement below by ACEA which affirms that Bermuda Teams breaking boards unintentionally cause "..they hit a big fish.." ( hilarious comment by ACEA beyond it happen) , but TNZ broke theirs on faulty structural built??????? There has been some recent uninformed comment and news reports concerning the America’s Cup Rules and the reasons America’s Cup teams voted to change various rules. In particular, there seems to be confusion about the new allowances for daggerboards and which teams have subsequently benefited from these changes. The foils that lift the boats out of the water are a critical design differentiator between the teams. Much of the design and engineering effort for this America’s Cup has gone into this area as it has such a big impact on performance. 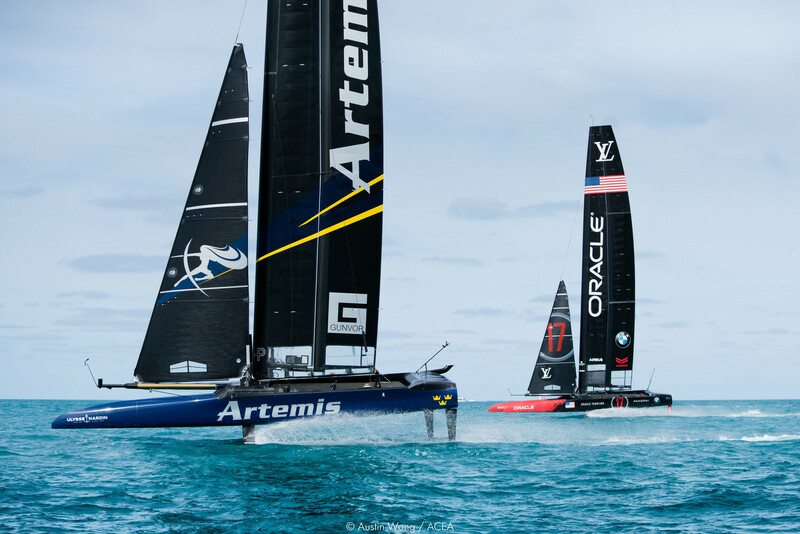 Teams are only permitted to build four daggerboards for their new America’s Cup Class boats – in other words just two sets of foils. Most teams have elected to build one pair that is geared towards heavier winds – smaller foils, less lift, less drag, higher potential top speed; and one set that will perform better in lighter conditions – bigger foils, more lift, but more drag and limited top speed. Notwithstanding the limit on building four new America’s Cup Class daggerboards, the teams discussed making a Protocol amendment beginning in June 2016 and agreed on November 17 to allow up to two identical (spare) boards to be built although these may only be used if the race boards were damaged unintentionally. The rules also allowed teams that damaged their boards to use old (non race) foils previously used on their AC 45 test boats, as replacements to allow them to continue testing while the race boards were being repaired. The rules have always limited how much a board can be modified after it has first been used before it is considered a new board and all modifications, repairs and substitutions to the four America’s Cup Class boards remain under strict conditions monitored by the Measurement Committee. Note that Teams are not permitted to make design progress in repairing or replacing a damaged board and the Measurement Committee monitors all work to ensure this is the case. Boards can be damaged by (for example) hitting a large piece of marine debris or even a large fish. Or they can break through poor execution of a maneuver, or faulty design and engineering or a flaw in the construction process. Some of the teams training in Bermuda damaged their boards when they had unintentionally hit objects in the water and were thus in favor of allowing replacement boards. It seemed to most, with the foils being such a critical component of the boats, that it would be ridiculous to have the America’s Cup result influenced by such an unfortunate and largely uncontrollable situation. All but one team supported and voted for a rule change. Emirates Team New Zealand voted against it, claiming they had built heavy and strong boards but they would not have built boards with such a structure had the new replacement board rule already existed. Emirates Team New Zealand contended that the teams were lobbying for the changes because of design and engineering flaws in the construction of their boards. Ironically, it appears that on the second day of sailing with their new America’s Cup Class boat this year, Emirates Team New Zealand significantly damaged one of their race boards and immediately also took the second board out of use which did not appear to be damaged. Neither board has reappeared on their boat in Auckland. Rather, Emirates Team New Zealand has fitted two of their old boards built for their AC45 test boat into their race boat to continue training. It should be noted that the damage did not appear to be caused by a collision with any underwater object. The team therefore now has the option to replace their damaged board with a new identical board but it must be of the same structure and geometry (Protocol 35.10 (f) (iii)). However, unless the damage was caused by a construction flaw, replacing the board with an identical daggerboard would seem to be unlikely solution because the original board may have been proven to be structurally inadequate. However, the requirement for repairs is that it has the same geometry as the original board and if more than 30% of the board is replaced in the repair process you can no longer make any modification to the geometry of the board. (Protocol 35.10(d)). Structural strength and/or stiffness is largely driven by the thickness of the boards. So if a board has been extensively repaired (up to or close to the allowable 30% limit) then you cannot then also modify the geometry and make their boards stronger, for example, by increasing the thickness. There are also weight limitations (5%) within the rule which would limit the use of alternative materials. The good news is that, should Emirates Team New Zealand not be successful in repairing its race board(s), under the new rules they could then nominate and use their board(s) built previously for their AC45 test yacht as replacement board(s), and continue to race in the competition.